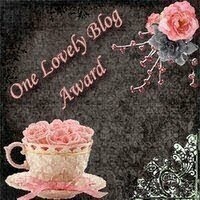 Then she made...: my very 1st blog award! Awww, shucks! Sooooo, many to thanks to Lizard & Ladybug. She nominated me and now I get to do the very same and nominate 5 other blogs that I love... now the hard part, which ones? and his or her blog link. 2. Pay it forward to 5 other bloggers that you have newly discovered. Super easy and fun. So, enjoy the little blog links and go check out their sites. You made my day! Thank you for the award. I am a new follower to your blog!